Saya is where the sword is kept when it is not in use. It has a little rope that ties the piece to the warrior belt. 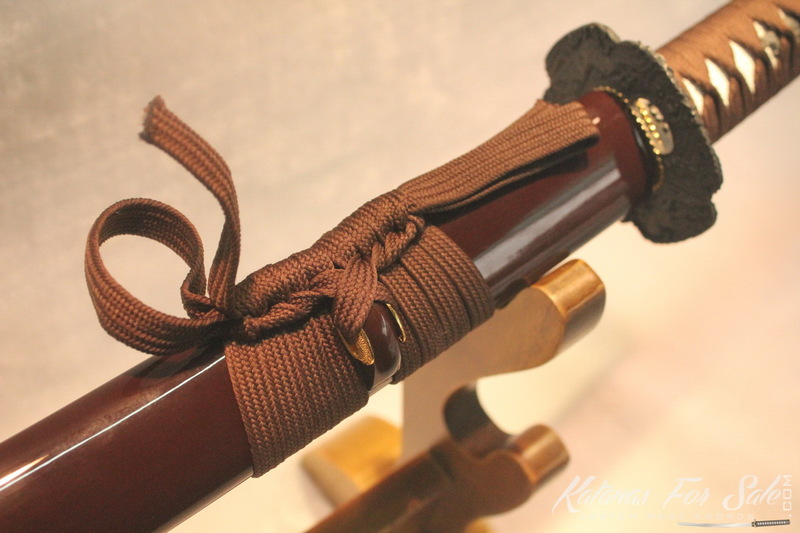 Made of several pieces, saya is cherished among Sword men, yet each piece has its particular name and role. Actually, the importance that has this item makes it as important as the sword itself there is no complete collection sword or functional sword without its associated Saya. 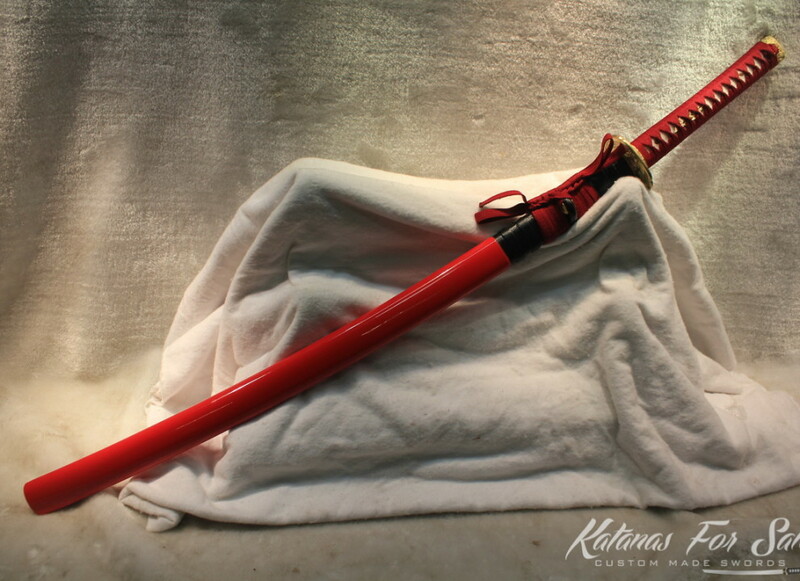 As in the Japanese culture there are several types of swords, there is also several types of Sayas. 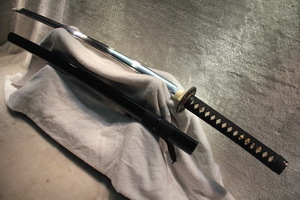 The distinction is based on the associated blade and the material of which the saya is made of. 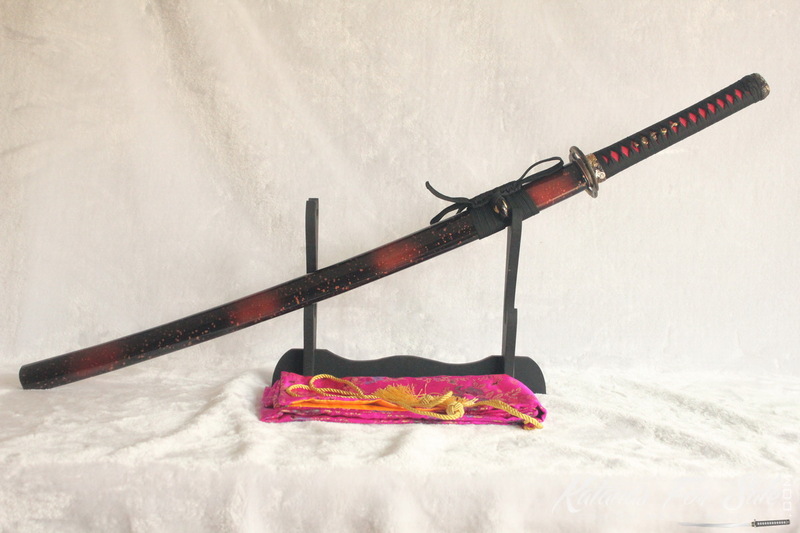 The word Saya refers to the Sheath or Scabbard that the warrior uses to keep the sword. Sayas serve to protect the blade when it is not in use. They serve also as support for the blade: the carrier has the blade within the Saya attached to his belt. Sayas are made the way not to scratch the blade and preserve his coating layers and therefore they need to be of relative tightness. They have to be hermetic and allow as few as possible moisture to form on the blade when it is kept. 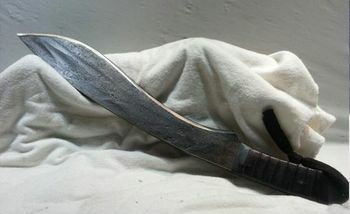 Sayas can also be used as weapon; in some martial practices; Sayas is used a complementary tool to the blade with which the warrior can strike or cover from strikes. 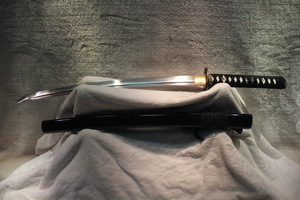 Generally, Sayas are made to fit the destined Swords: if they are to keep Ninja sword or Samurai Sword; if they are to be associated to functional sword or decorative one. These factors can affect the proficiency level required for the realization of the piece and may also affect the material to use for the construction. Sayas are real pieces of art; they are designed the way not to create any contrast especially with the Tsuka. Saya and Tsuka should complete each other and the design has to be uniform with no discontinuity to the point that Tsuka and Saya should appear as one piece. 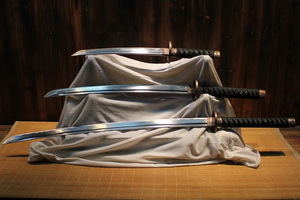 Moreover, looking to the Saya and Tsuka, one is to be considered as the reflection of the other. Already, they are made of the same material and precisely from the same piece of material. Saya designates the whole tool. Actually it is composed of several parts and several materials. Saya is made of a particular Wood type produced by a tree called magnolia. The Magnolia wood is light, dry and easily worked. The carpentry procedure is simple but needs to be conducted with precaution and care not to destruct and therefore lose the piece of wood. The main material is Wood, yet some parts are in metal and can be iron or aluminum. – Koyiguci: refers to the mouth of the Saya, it can be in contact with the Tsuba or can be separated of it by few millimeters (4 to 5). – Kojiri: refers to the end of the Saya. This item and the Koyiguci are usually made of Buffalo horns. – Kurikata (Kurigata): it is the point where the Sageo is to be attached. – Shito dome: is an ornamental piece that is placed on the Kurikata. The Shito dome is commonly made of glowing metal that can be of various shapes and can even be a sculpture. 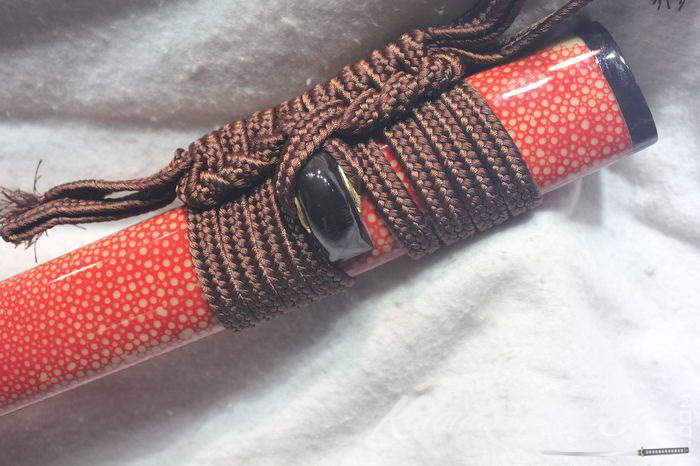 – Sageo: is the little rope used to tie the Katana Saya to the belt. The rope is made of the same material that the Tsuka Ito and usually it is Nylon. Sayas are made according a traditional method. This method requires a good knowledge and a high level of proficiency because all is about precision; otherwise the wood piece would be destructed and lost. The work is therefore to start over. The piece of wood is to split into two equal parts and then the blade is sketched on the inner sides of both parts. Using the appropriate tool, the wood is removed from the surface limited by the blade sketch. The Saya maker has to test the amount of wood to remove in order to keep the Saya tight enough to not scratch the blade but it allows that the blade slips easily. applying Glue on the facing edges. When the glue dries, it is possible to mount the parts of the Saya to complete the work. 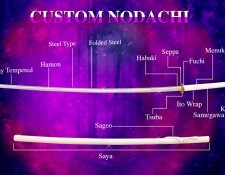 Choosing the different parts is function of the overall design of the Sword, the purposes and the budget of the buyer. 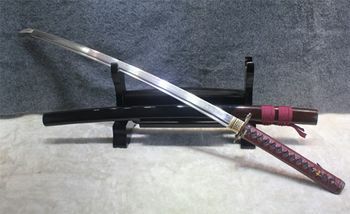 It is obvious though that the Saya and the Tsuka complete each other. 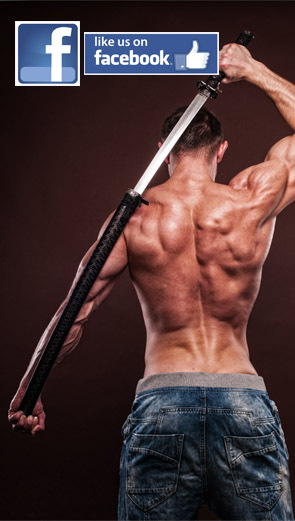 Sayas of military Swords differ from Sayas of regular Katanas. The parts do not look the same and they are not mounted the same way. The Military Sayas contains more metallic parts than regular Sayas. They are supposed to be decorative pieces then the design is to be more attractive. After placing the two pieces of wood together, applying lacquer is the step that follows. Before mounting the different parts of the Saya, it is important to make the outer surface of the wood as glossy as mirror. Japanese history has some interesting methods and procedures that allow lacquering Sayas into real pieces of art. 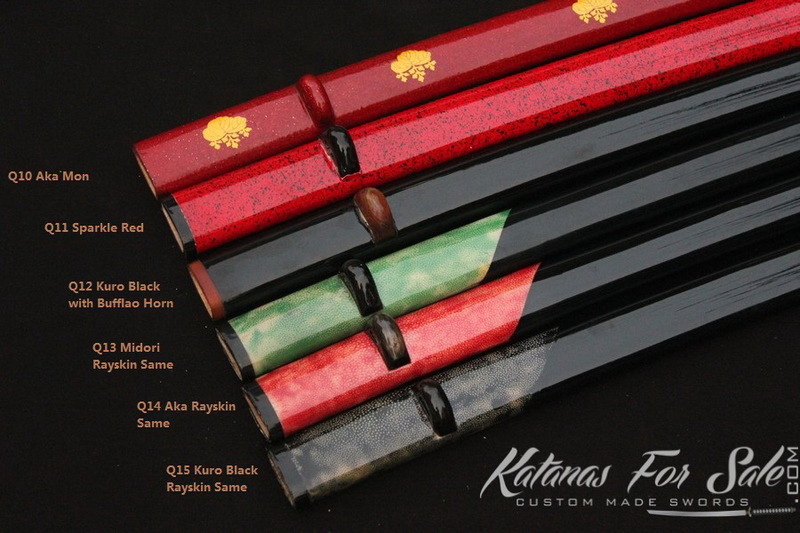 There is a real lacquer painting store and the buyer can choose the lacquer type that suits him; also the painter can select the lacquer type that would fit with the overall design of the Sword and the Saya parts. First, the saya surface would have no scratches, wholes or any shape that may prevent the uniform glossy effect. The cleaning process is often done with Abrasive Paper serving to polish the wood surface. Then apply Shellac, Lac and Varnish -which are three lacquer products to use to apply the lacquering coat- in several layers or simple layers to obtain the desired glossy shining effect. Applying the lacquering materials can be done by spray or by brushes, the result is the perhaps the same but the time consumed is very different.